A few months ago I was asked by Packt Publishing to help reviewing a book called Building a Home Security System with BeagleBone which you can buy and read here. 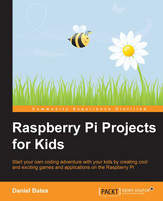 Now they asked me to write a review of their recently released book titled Raspberry Pi Projects for Kids. I’ve read it on the weekend, and liked it very much. The author knows how to keep the attention of the reader (who is possibly a kid) through the book. The introduction section is pretty straightforward and well illustrated with photos, so anyone can understand how to power a Raspberry Pi up and install the operating system. The book’s structure is good, it’s nice that the introduction starts with using Scratch which I think is a very good tool to show kids how programming works. Building a simple Angry Birds clone with it is quite simple yet entertaining, and shows a lot of the capabilities of Scratch. The next chapter is about building a simple controller device and wiring it to the Pi. The author should have included some actual photos of the building process, not just schematic images, but at least those are fine and a crafted kid would be able to build it by reading the book. The Python examples are easily understandable and explain GPIO pin usage clearly. The interactive map chapter shows how to use GUI elements with a nice example using Google Maps API to download map images and displaying it in a self made application window. The chapter also explains how to interact with the window.